It’s a busy blogging week for me! In addition to all of the #Choctoberfest recipes I’m sharing with you, I’m also participating in the Fantastical Food Fight today. Fantastical Food Fight is a blogging challenge created by Sarah of Fantastical Sharing of Recipes. She picks a theme and bloggers get to create a recipe falling under that theme. To join us or learn more about it, visit her page with the info. The theme for this month is pickled peppers. Of course, the second I read that I immediately went into the childish tongue-twister and determined how many pickled peppers Peter Piper could pick. And then I promptly realized I had no idea what I was going to make. I always have a jar of pickled jalapenos and pepperoncini in the fridge, but I’ve kind of exhausted the recipes I could make with the pickled jalapenos. I debated pickling some peppers myself but simply ran out of time. However, my aunt and I were talking about getting together and canning a bunch of recipes, so its definitely on the list. 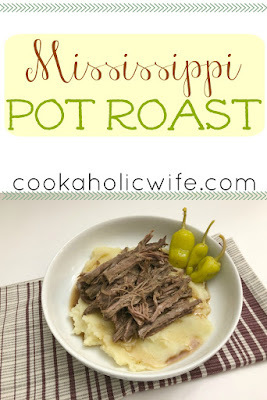 In the end I decided to go the most common route and make a Mississippi Pot Roast, simply because I’ve never had one before. An easy, hearty meal made with a pot roast, pepperoncinis and some flavor packets. 1. Heat the olive oil in a large skillet over medium high heat. Season the beef roast liberally with salt and pepper. 2. Once hot, place the roast in the skillet and cook for 3-4 minutes on each side, allowing a nice brown crust to form. 3. Transfer the meat to a slow cooker. 4. Sprinkle the ranch dressing packet and au jus gravy packet over the meat. Place the stick of butter on top, and arrange the pepperoncinis on and around the meat. Pour the water into the crock pot. 6. 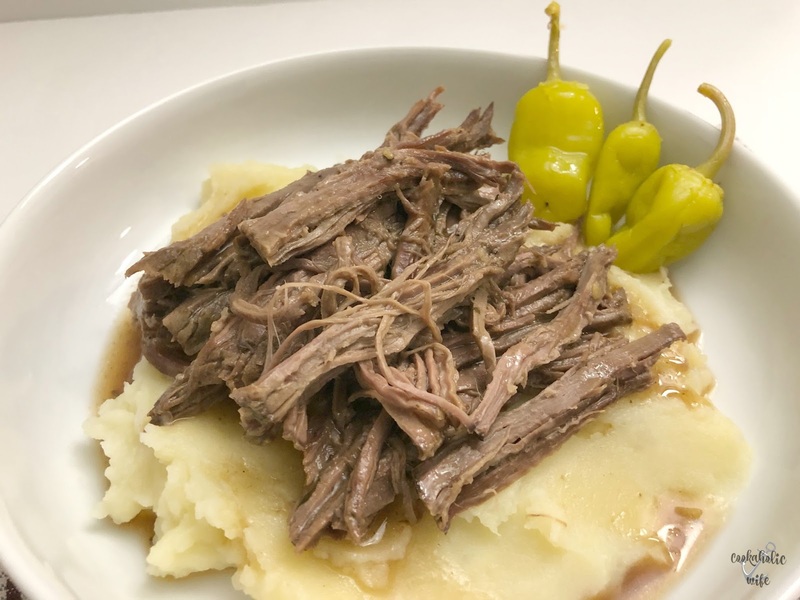 Shred the meat and serve over mashed potatoes or rice. *The water can be replaced with juice from the pepperoncini jar to make the flavor stronger. Adding additional sliced pepperoncini on top after serving also enhances the flavor. 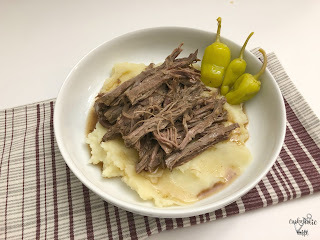 How in the world have I never had a pot roast this amazing before? I mean, really? I’m going to guess it’s because my mom wouldn’t know what a pepperoncini was if one was sitting right in front of her, so even though this is a crazy easy to make dish which is right up her alley, it’s never something she would have been interested in trying. I, on the other hand, have now found my go-to pot roast recipe. The internet has also informed me that if you have leftovers and don’t want to freeze them, you should serve up some of the meat on a roll with melted provolone cheese. Umm, sold?! Not only have I never had it, I have never even heard of it until now. It sounds amazing and it's made in a crockpot. Now that is a win/win. It is such a busy week isn't it? This sounds amazing and I love anything crock pot. This pot roast is referred to as "THE Pot Roast" in our house. It's our absolute favorite and we have it at the very least once a month, but sometimes more. 🙂 Perfect pick for this month!